Consider this: You arrive at your friends’ place, all ready to lead your race to a higher state of development – only to find that crucial components of the GAIA PROJECT game material are mixed up or even missing because you neglected to properly sort the game’s components. Bummer! And so you frantically start looking for structures and cards, markers and tokens, all the while wasting time that could have – and should have – gone into playing the actual, fabulous game. But no worries, with our help that scenario will not materialize. As you probably know, Feldherr specializes in designing and producing custom foams for keeping board game miniatures and accessories safe from breaking and incurring other types of damage. What you might not have known is that we also create Organizers whose prime purpose is – well – to help you organize board games with massive amounts of content. Of course GAIA PROJECT, which comes with literally hundreds of small parts, fits into that category of games. And of course, we’ve got something in store for it. Unlike other sorting solutions for GAIA project, our Organizer consists of fine-pored, high-quality foam. This ensures it’s extremely low weight, making transport a pleasure. Since the foams are designed to fit into the original game box, they are supported by the game box and will thus remain in shape. The Organizer consists of one main foam tray, one foam insert and one matching foam topper. 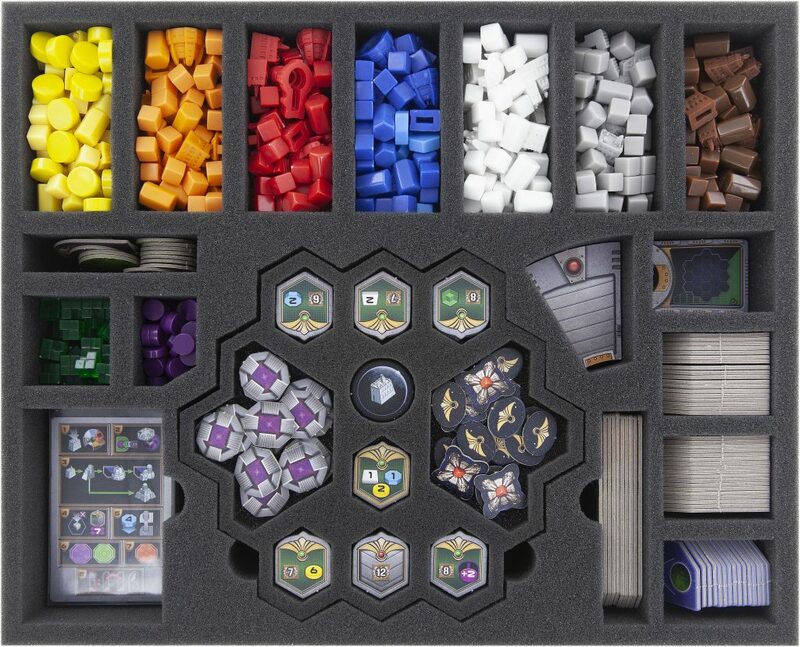 The main tray features 19 smaller compartments which will hold the markers of the respective colors in addition to (sleeved) cards, power tokens and game material like round scoring tiles. 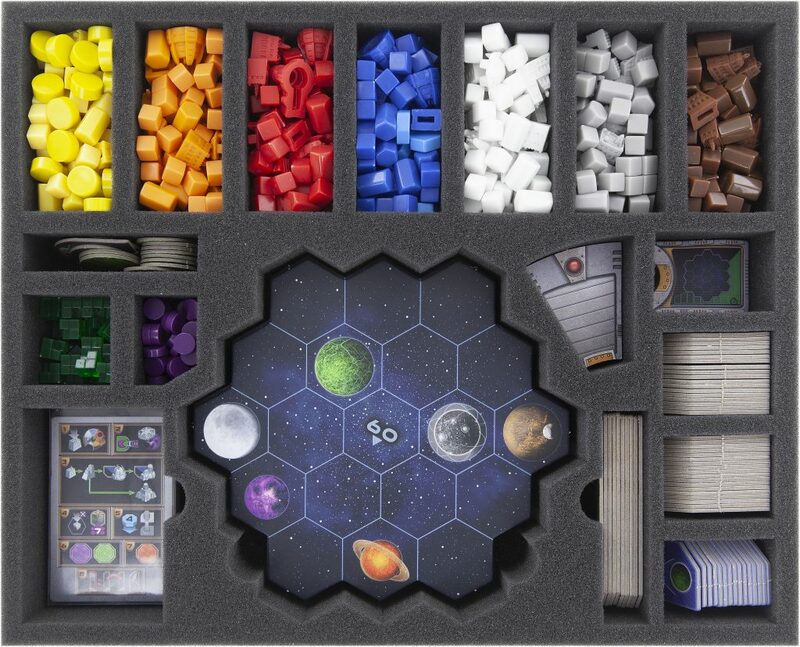 In addition to the 19 compartments, there is a large extra compartment for the sector tiles. The foam tray is now level with the foam insert. Next, simply place the foam topper on top to make sure nothing can fall out of the Organizer. 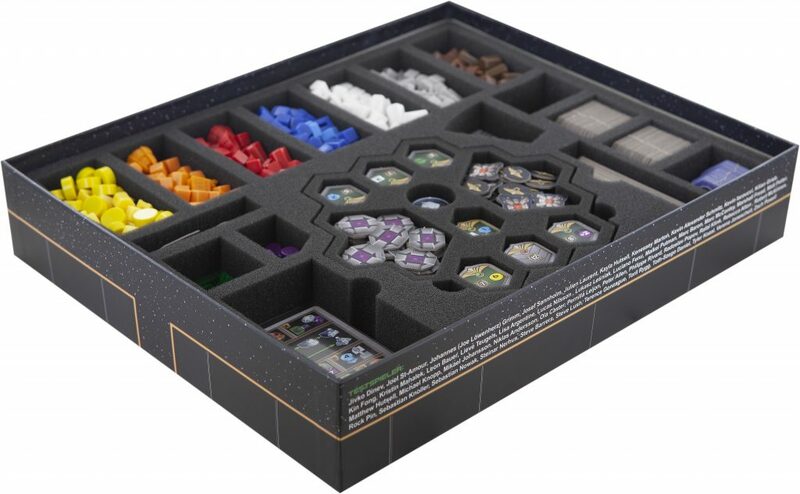 Finally, lay the larger game components like research board, scoring board and faction boards on the foam topper, close the lid and all your worries are a thing of the past. Satisfied with our foams or not? Let us know! What about you? Did you or do you still have sorting troubles with GAIA PROJECT? Or did you get hold of our Organizer and would like to remark something? Let us know via e-mail or write us on our Facebook page.